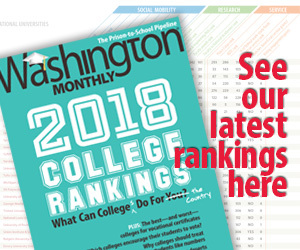 Washington Monthly | Missouri to Eliminate Higher Education Department? Missouri to Eliminate Higher Education Department? Missouri’s higher education commissioner, Robert Stein, announced in November that he was going to retire in July. And so the state earnestly began a search for his successor. The Missouri Department of Higher Education even posted the job advertisement for the position right on its Web site. Facing the prospect of being merged out of existence, Missouri’s Department of Higher Education has halted its search for a new commissioner. Department spokeswoman Kathy Love said the board held a first round of interviews Monday but decided to slow down because of Gov. Jay Nixon’s recent proposal to merge the small Department of Higher Education with the much larger Department of Elementary and Secondary Education. They would create a single Department of Education. Missouri is not the first state to consider a move like this. In January a South Carolina legislator proposed eliminating the state higher education commission to save money. In a less dramatic move, Rhode Island managed to save a few hundred thousand dollars by eliminating a higher education oversight position through questionable hiring.